The year 2012 seemed to fly bye, yet when I think of certain things that happened throughout the year, they seem so long ago. I have a good feeling 2013 is going to be an amazing year. I finally signed up for Google+. If anyone has any tips with how to use it, I'd love to hear them. Next, you asked and I listened. I kept getting requests to add a "pin it" button to my posts and I finally did it. I added the button to each of my pictures. If you find it isn't working properly, please let me know. If I order a taco at Cafe Rio, I get their Shredded Beef and I always order a side of the house dressing. 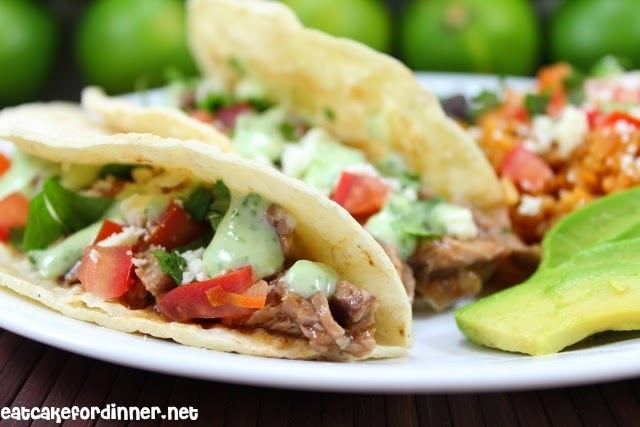 I have seen (and tried) so many copycat Cafe Rio recipes, but this was the first time I had seen a copycat recipe for their shredded beef. The flavor was delicious. My only problem was I either undercooked my roast or overcooked my roast, because I wasn't able to shred it. It was still juicy, it just didn't fall apart like usual when I cook a roast. I blame it on my slow-cooker. I ended up cutting it into strips (like their steak). When topped with the copycat dressing, it tasted pretty darn close to the real thing. I just need to figure out how to cook my roast properly and I think this will become a new favorite. 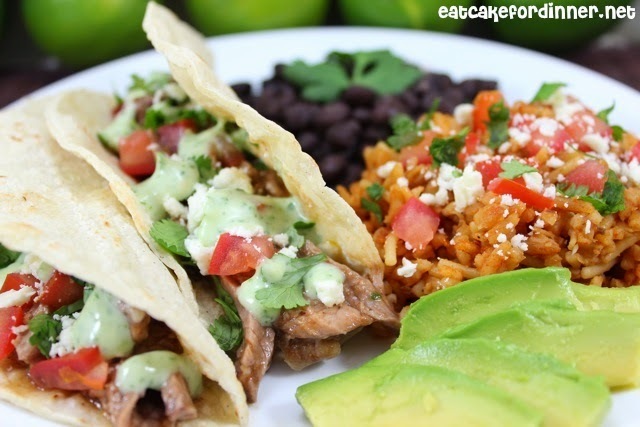 Next on my list to try is a Copycat Cafe Rio Rice Recipe. Anyone tried one and liked it? Jenn's Notes: I wouldn't change anything with the above ingredients and measurements. I loved the flavor of the beef and the tomatillo dressing. looks divine...i love me some cafe rio!! we eat there every time we go visit our family in utah...and oh, the joy!! can't wait to try this! Thanks for the pin it! Thank you, I'm going to love this. Cafe Rio is my favorite place to eat. That sounds great, dinner tomorrow! If your slow cooked meat doesn't fall apart you haven't cooked it for long enough! It takes a lot of time for those connective tissues to break all the way down, so if it doesn't shred it needs to cook for longer. Hope that helps. Happy cooking! This looks amazing! Now I want this for breakfast! Outstanding!!! Just pinned this. I love Mexican Food!!! I have to try this one, love Mexican food!! Made it for my family tonight. Was told to ditch the old recipe for this one. thanks Jen! That is awesome, I'm so glad everyone liked it! I had the same problem with my slow cooker. When I was first married I had this Rival Slow cooker and everything was a disaster. I ended up getting a Hamilton Beach slow cooker and voila moist meat that shreds! I can't tell you how much teasing I got from my husband until I could prove it wasn't me. One other thing that helps is browning the chuck roast on all sides in olive oil...it keeps the juices in. Excited to try this recipe out...especially the tomatillo dressing. Made already at least 5 times, people love it perfect!